Since the demolition of the old Town Hall on Fabian Road the ironstone obelisks have been moved to this new location at the City Learning Centre on Normanby Road. I don’t think this will be the final home of the 2.5 tonnes items as its just a temporary home for the council. I’m adding these comment by Dave into the main article as I think its important given the current council squabbling about where they should be. “I think it wrong to say that the Fabian Road Town Hall pillars originally came from Eston Hospital, as they were there some 20 years before the hospital was closed and demolished. I gather they originally came from a set of four or more pillars sited on the entrance drive at Bolckow Vaughan’s old mine and works offices – Cleveland House – on Middlesbrough Road E in South Bank, a building that was bought from BV, when the firm went into post WW1 decline, by the old Eston Urban District Council. A total of five pillars are currently in existence with two more at the old Eston Hospital site and one in South Bank. 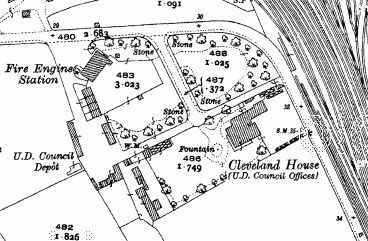 Having checked OS maps from 1915 and 1929 for Cleveland House it looks like the pillars are no strangers to movement as they change position there when the Fire Station is built. This entry was posted in Eston, Ironstone, Normanby by chris.twigg. Bookmark the permalink. What are they? And why are they? Make from ironstone from the local mine, I believe they originally all came from the Miner Hospital in Eston but have moved many times over the years. Oh dear…. this raises old controversies that I never wanted to get too involved in, in my time, and which have rumbled on ever since. I think it wrong to say that the Fabian Road Town Hall pillars originally came from Eston Hospital, as they were there some 20 years before the hospital was closed and demolished. I gather they originally came from a set of four or more pillars sited on the entrance drive at Bolckow Vaughan’s old mine and works offices – Cleveland House – on Middlesbrough Road E in South Bank, a building that was bought from BV, when the firm went into post WW1 decline, by the old Eston Urban District Council. I gather the pillars were originally crafted for the building and used as a motif for BV’s trade exhibitions. This, of course, means there were more pillars in the beginning and there were definitely a set at Eston Hospital These are now back. Whether they also originally came from Cleveland House, I don’t know. I expect they did. Given that the rather artificial political squabbles that have surrounded the siting of the pillars over the years, it’s probably a relief that the issue seems to have been settled to everyone’s satisfaction (but I won’t hold my breath on this, given the limited horizons if most of those doing the arguing) The fact is, is that ironstone and ironstone mining is a common part of this areas heritage. It cannot be restricted to just one or other settlements……………. Thanks for clearing that up Dave, it does seem to be needlessly political. I don’t see them rushing to actually take care of the actual relics such as the Guibal Fanhouse and Powder House which have been vandalised and forgotten for decades. Hear hear. I recall one councillor (no name, no pack drill) who has been very artificially vocal on the issue of late, once calling me a ‘retrophile’ (a name he made up and was very proud of) when I was once suggesting in the council chamber that some of our local industrial historical heritage was worth preserving – and this would inevitably cost ratepayers money…………. I think David Walsh former council leader has got most of the facts correct on the Iron Stone Pillars / Obelisks. Two now in Eston on the old hospital site now a mini housing estate. Two outside the new Civic Centre / Town Hall on Normanby Road Teesville part of Normanby Road. One on the Asda South Bank. A former and current council leader, clearly a hot topic ! Personally I don’t mind where exactly they are as long as they are kept safe and visible to the public. Didn’t know there was one at or near to ASDA. It seems to show that these pillars were churned out on an industrial scale. I hope the ones at ASDA at in good condition and will be safeguarded for their future. It is my belief that BV made at least 6 of these pillars for exhibitions – maybe even the 1851 Great Exhibition – and four of these were erected at Cleveland House, and two at Eston Hospital. Plainly visible on maps, and remembered by older residents. 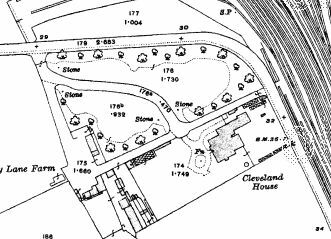 BV borrowed the Cleveland House stones from the Eston UDC for a further exhibition, after Cleveland House had been sold to the council, which may help explain the change between the 1915 and 1929 maps. The Cleveland House stones moved again, to the new Town Hall when it was built, (1960? ), the Eston ones went into storage when the hospital was demolished, and one was placed outside Asda the following year. Following lobbying from Eston councillors, two of the Town Hall pillars were ‘returned’ to the hospital site, where they had never been before. The other two being those shown at the head of this entry. The ironstone Obelisks at Eston hospital were monad to Eston Town Hall about 1980 by myself and Tony Harrison as we both worked for Langbaurgh council our supervisor was Michael Rynn and we worked out of Cleveland House Middlesbrough road South Bank. Then they were moved from the Town Hall Fabian road to the City Learning Centre on Normanby road. I was also involved in moving thes as a Works Manager for carillon carrying out the works for Redcar and Cleveland council.